The "Duo" System is an integrated plan for bed bugs and/or dust mite control. The "Duo" System includes the "Superior" or "Ultimate" style total mattress encasement plus a removable "Simplistic" Overlay. 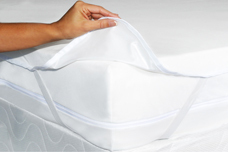 Mattress Safe ® Total Mattress Encasement features the patented "Zipper with the Hook"®. Impermeable to Bed Bugs, Dust Mites, Mold and Bacteria. Mattress Safe® "Duo" system features an innovative soft and luxurious stretch knit fabric, carefully selected to be designed for comfort and easy care, while providing durability and protection for all applications. Joined to a unique lightweight barrier, Mattress Safe® "Duo" System Protector provides waterproof protection against spills and fluids for pillow top and non-flip mattresses. With the addition of the Simplistic Overlay to our regular mattress encasements, the "Duo" System allows for easy cleaning of spills and soilage of the Overlay without removing the mattress encasement during bed bug treatments. Bed bug certified, Mattress Safe® Total Mattress Encasement has been tested by board certified entomologists and certified for protection against bed bugs and dust mites. You can sleep safe and sound knowing that bed bugs cannot bite through the laminated fabric of Mattress Safe® Superior or Ultimate mattress encasements. The zipper and hook combination prevents further infestations and quarantines infected items from spreading pests. By applying Mattress Safe® mattress encasements before any signs of bed bug infestation, you will minimize the available areas for nesting as well as provide the means for an easy detection of bed bugs. As a pest management application, Mattress Safe® encasements eliminate the use of chemicals to entrap and kill bed bugs in an infested mattress. A minimal investment in mattress encasements can prevent the loss and the heavy cost of replacing a mattress and box spring. Even without a problem, Mattress Safe® products are a cost effective and preventative measure in protecting your bedding investment.